Call us or stop by for details. Hurry, you don't want to miss this great offer! Don't forget to sign up for our newsletter so that you don't miss any sales or important news. Still looking for the perfect Christmas gift? We are offering 10% off Powerwinch Brand winches now until Dec. 12th. 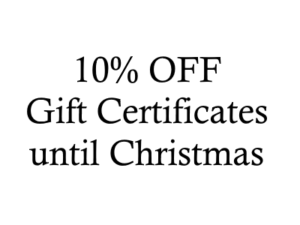 If you are not sure which one they need, we are still offering 10% off the purchase of Gift Certificates until Christmas! Call us or stop by for more details. Limited time offer, cannot be combined with any other discounts or offers. First we would like to say Thank You to everyone who stopped in and supported us during our Black Friday Sale! For those of you that missed the sale, we are offering 10% off on Gift Certificates from now until Christmas. Stop in and get yours today. You may also call us and we can process your order over the phone and mail the certificate to you. You will receive 15% OFF Store wide and Free Coffee and Donuts! 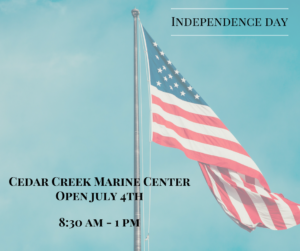 We will be open from 8:30am - 5pm both days. Sign up for our newsletter or follow us on Facebook to stay up to date on the latest sales, events, and hours. 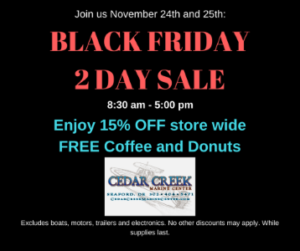 *Sale excludes: boats, motors, trailers and electronics, No other discounts may apply, 2 days only, Free coffee and donuts while supplies last. Now is the time to give us a call, or request a quote on a repower. 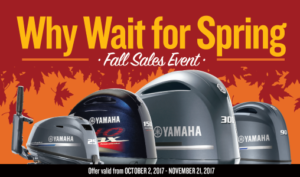 Yamaha's Why Wait for Spring Fall Sales Event is going on from October 2, 2017 to November 21, 2017. 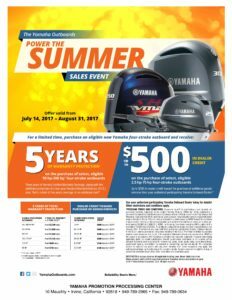 For a limited time, purchase an eligible new Yamaha 90hp - 300hp four-stroke outboard and get 6 years of Warranty Protection, or purchase an eligible new Yamaha 2.5hp - 75hp four-stroke outboard and get up to $750 credit. Click on the picture above for more details. 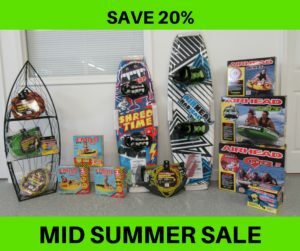 Now is the time to stock up on great deals at Cedar Creek Marine Center with our Mid Summer Sale. Stop by and check out our sale display, 20% off in stock items for a limited time. *Discount on in stock specially marked items only. No other coupons or discounts may be applied. Limited time offer. Have you procrastinated and not gotten Dad anything for Father's Day yet? Don't worry, we all do it from time to time! We have tons of great gifts for the boater in your life. Not sure what he needs for the boat? A Cedar Creek shirt makes a great gift for Dad. 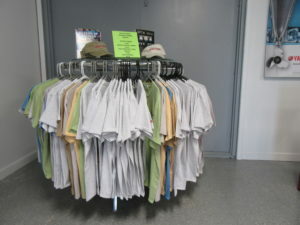 We have various shirt designs in a wide range of sizes at both our Milford and Seaford, Delaware locations. Also new this year are our white long sleeve performance shirts. They are perfect for those hot summer days out on the boat. 2. 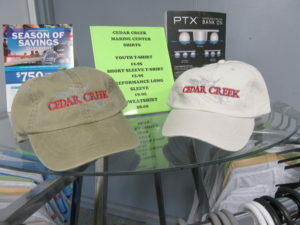 Pick up a redesigned Cedar Creek Hat or a new pair of Calcutta sunglasses. No boater can ever have too many of either. 3. We carry a wide range of boat soaps and waxes. 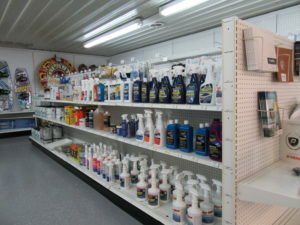 We can help you pick out the best products. Add a nice touch to this gift with a note promising to wash and wax the boat for him!! That's a gift he'll be sure to love. 4. 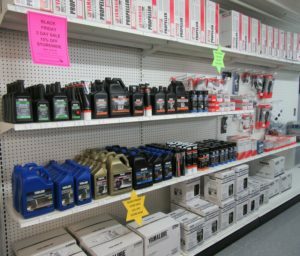 You can't go wrong with the essential maintenance items for his boat and motor. 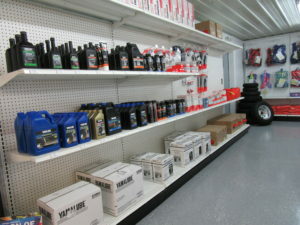 We carry Yamaha oil, Yamaha's Ring Free, fuel stabilizers and additives. Dad will appreciate that you were thinking of him and his boat this Father's Day. 5. We have gift certificates! We're not saying that Dad is impossible to buy for, but a gift certificate is always a great for anyone. You can stop in and pick one up. You can call and have one mailed to you, but it will not arrive before this Sunday. 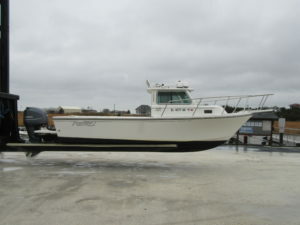 And of course we always have new and pre-owed boats and motors to pick from if your feeling extra generous this Father's Day. So there you have it, 5 great gifts for the men in your life this Father's Day. 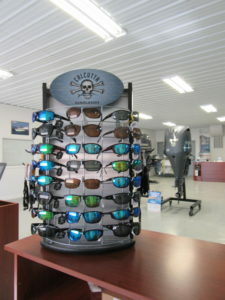 Stop by one of our two locations: in Milford, DE or Seaford, DE and pick something out today.